MDC Alliance Spokesperson Welshman Ncube (file photo). 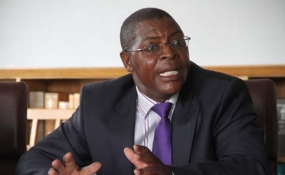 MDC Alliance spokesperson Professor Welshman Ncube has called for dialogue among political parties, saying it is important that there is engagement even if parties differ on which path the country needs to take. Before the elections, political parties that were represented in Parliament met periodically and their engagements led to the crafting of an Electoral Code of Conduct. In an interview, Prof Ncube said it was necessary for political parties to continue engaging at various forums. "As Zimbabweans, even when we are in complete disagreement, we must always remain engaged with each other at all levels. "For instance, it is important to engage around issues of making sure that we restore peace, to engage to ensure deflation of various pressures," said Prof Ncube. "There is never a time when dialogue is unnecessary, dialogue is always necessary even if it's to dialogue in order to disagree." He said there was a need to activate political engagements as it was done prior to the elections. "Before the elections, there was tripartite forum of the parties represented in Parliament (zanu-pf and the two MDCs) which were engaging through the secretary-generals forum," Prof Ncube said. "And that forum has not been reactivated for any re-engagement post the election results announcement. So there has been no conversation informally or formally, which used to take place at the secretary-generals forum as the tripartite." He said although the MDC-Alliance was taking the legal route to challenge the election results, there were some issues that require dialogue among political leaders. Prof Ncube said the opposition party was not happy with the treatment of some of its supporters. Post-election violence erupted in Harare last week on Wednesday after MDC-Alliance supporters went on the rampage destroying and looting property. The skirmishes led to the death of six people, with President-elect Emmerson Mnangagwa saying he will set up an independent commission to investigate circumstances leading to the unfortunate deaths.